Picture me at 6, a rather tiny girl with two long braids wearing a Mother-made flower-print dress (ah la Little House on the Prairie) carrying a stack of books that tucks precariously under my chin, trotting down the library steps. Now picture me at 28, still pretty tiny with a DIY Star Trek-inspired haircut (only partially by accident…) carrying an even larger stack of books (longer arms, hurray!) that tucks pretty expertly under my chin, trotting down the library steps. Some loves are forever, folks! 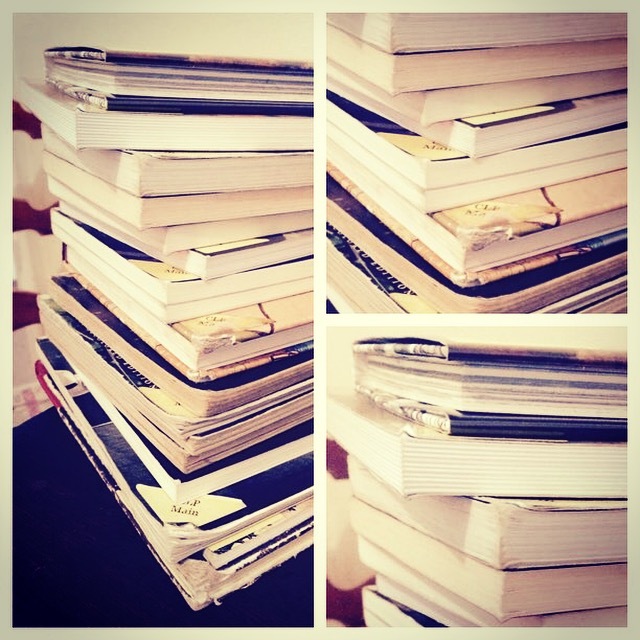 I’ve been reading a lot so far in 2015, despite being amazingly busy – or perhaps because of being busy. Instead of sinking my teeth into a 1,000 page tome as I often do midwinter, I’ve been sticking to short books. Adventures that last an evening or a couple of days at most are more my speed this year. There have been a lot of new people and passions popping up in my life lately, and my reading reflects that. I’m confident that some of these people and adventures will be more than brief encounters, both on the streets and on the page. For instance, I started reading Neil Gaiman’s The Sandman series at last, and tumbled into Brian K. Vaughan’s and Fiona Staples’ Saga. 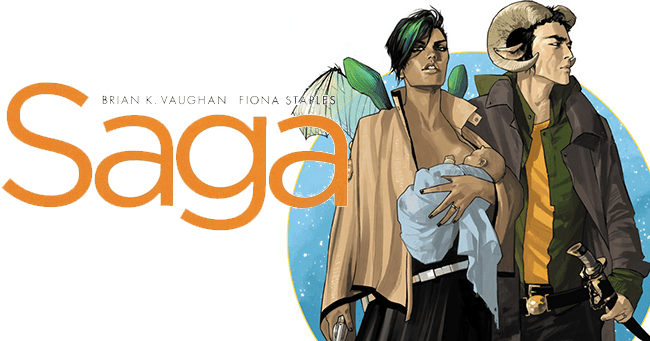 Saga is by far the best comic I’ve read in ages, which is saying a lot since I mentioned The Sandman in the same breath. The two can’t be compared, I just happened to read them at the same time and I am entranced by Saga and…intrigued by The Sandman. Anytime the story runs the risk of flying out of control the narration of the child, Hazel, draws everything back in with such amazing, often amusing deftness, that I was left with my jaw hanging more often than not. 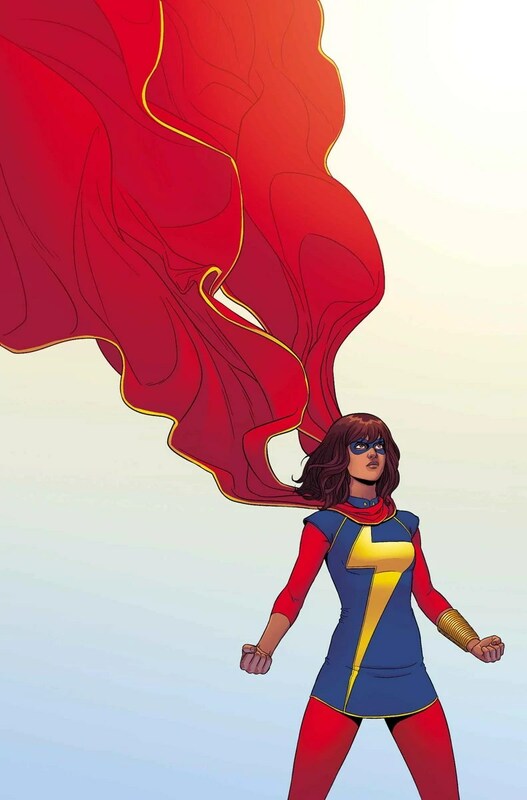 Fiona Staples’ artwork is gorgeous, and it more-or-less floored me on every page. Her colors glow, her characters are beautiful (or beautifully grotesque) and the worlds she makes are lavishly, ridiculously detailed. 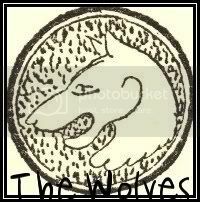 The character development, the diversity, the sunburst of imaginative storytelling that is contained in this series…! I have been pretty literally pushing this into my friends’ hands, and have begun the torturous journey of actually buying a comic issue by issue… Bah! It’s even worse than watching a weekly TV show! If you somehow haven’t read Saga yet and need more convincing, read this article by Hannah Means-Shannon, who manages to be much more coherent about what makes the comic great, and even important. While I wait for more Saga to come out, at least I can read The Sandman. The insensible gush that I am reduced to spewing when I talk about Saga is exactly how I remember my friend Leila (who writes Bookshelves of Doom) talking about The Sandman years ago… I’m reading Vol. 5 now, and I’m enjoying it overall. I generally dig anthropomorphic personifications, and the central character of the series is Dream (one of my favorite pastimes, incidentally), so I would be hard pressed to dislike it. 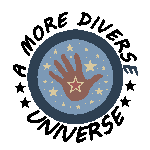 Something isn’t quite jiving yet for me though – the stories aren’t getting under my skin the way I expected them to. I like the gritty, urban fantasy setting, and I do love the perky, wise, female character Death, but I’m not gripped. Gaiman is a masterful storyteller, and the myth and mystery of the world of The Sandman is admirable. The artwork is intense and brooding, no matter who is drawing it. I’ll continue following Dream down his dark road, but only out of curiosity right now, not compulsion. We’ll see what the next dream holds. 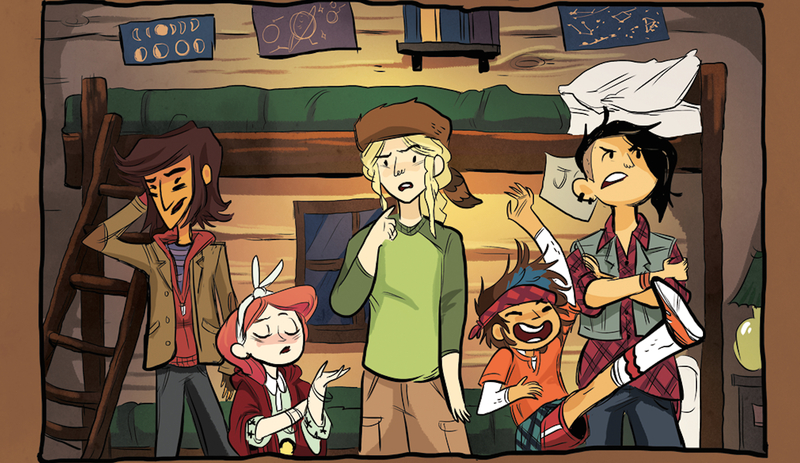 Another terrific comic is Lumberjanes by Noelle Stevenson, Grace Ellis, and Brooke Allen. It is about five friends who have mad-capped adventures at a summer camp for the more scrappy sort of gal. They fight off yetis and three-eyed foxes, go over waterfalls in canoes, make it out of a booby-trapped cave, put up their dukes against a pair of squabbling gods, and take friendship to the max! This is another comic that has me up on a chair cheering. I heart it so hard. I am reading it issue by issue and I’m antsy for a new one! I read lots of stand-alone comics as well, such as Julie Maroh’s pretty Skandalon (didn’t care for the story much,) and Hannah Berry’s devilish Britten and Brülightly (I’ll certainly read more of her work). I liked Rutu Modan’s Jamilti and other stories well enough, and enjoyed the second volume of Aya by Marguerite Abouet and Clément Oubrer. I was striving to read as many graphic novels/comics by female authors as I could, although all the Sandman and Saga among other things still kept my male/female author stats about even for the year so far. I love the random discoveries that I make, totally independent of blog reviews or friends’ recommendations, or my never ending “threads” – the books that just tumble into my life while I’m poking through the library stacks for something else entirely. 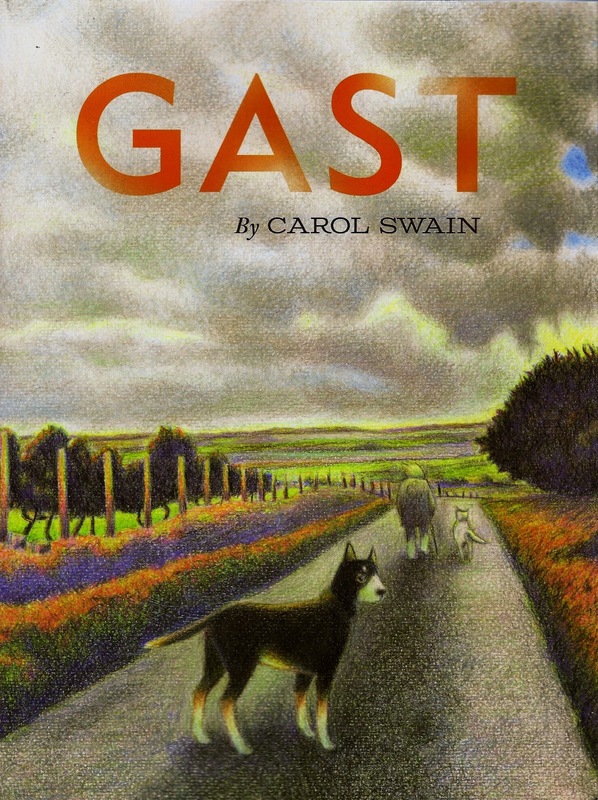 Gast by Carol Swain found me recently. It tells the tale of Helen, a young bird watcher and amateur naturalist who has recently moved to rural Wales. She reminds me so much of myself at that age, and I imagine I would have acted similarly to her – wandering solemnly across the countryside, solving mysteries, talking to animals – if I hadn’t had a hoard of sisters to keep me company. Helen learns about a “rare bird” that has recently died on the nearby farm, and she investigates slowly and thoroughly. She comes to a gradual understanding of her former neighbor Emrys, who kept sheep and liked to wear makeup, and ended his lonely, misunderstood life one afternoon while his dogs kept watch. The story is told in black and white, nine panel pages, with minimal speech and no narration beyond the notes you can read over Helen’s shoulder. Carol Swain’s use of silence is wondrous. Helen watches, and thinks about things, and feels things, and you can think and feel along with her, feel the breeze wafting across the Welsh hills, and hear the gentle baaing of the sheep. Gast (which means “girl” in Welsh) caught me entirely off guard and proved once again why the graphic novel format is so unique and special. Highly recommended. 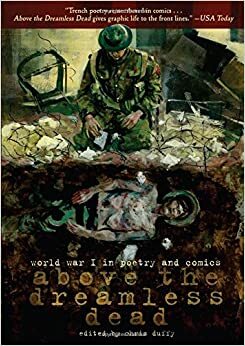 Above the Dreamless Dead: World War I in Poetry and Comics edited by Chris Duffy was another excellent random discovery. I hadn’t heard of the Trench Poets before, so this collection of their poems, adapted by some of the best cartoonist working today, was a good introduction and a pretty amazing concept. The poems are haunting, painful, full of the agony and horror and dark humor of war as penned by the likes of Siegfried Sassoon, Rupert Brooke, Isaac Rosenberg, and 10 others – many of whom died before their words were ever heard. The reproduction of the poems as visual things was carefully, respectfully, and brilliantly done by each artist. They’re brutal, beautiful renditions, a duet of writer and artist the illuminates and compliments both aspects. Each piece tears at my heart, but I found Luke Pearson’s adaptation of Channel Firing by Thomas Hardy, S. Harkham’s riff on War by Francis Edward Ledwidge, and Isabel Greenberg’s take on Therefore Is the Name of it Called Babel by Osbert Sitwell especially effective/affecting. James Lloyd’s vision of Repression of War Experience by Siegfried Sassoon was also incredible, bringing to life the reality of living with “shell shock”, so misunderstood at the time and still horribly relevant. Ugh, this book, you guys. It’s a hard one, but it’s so good. And I’ll leave you with that for now. I have other books I want to spread love for, but I need to consume more than just black tea today and also walk my housemate’s dog and look at the snow and go listen to some music tonight, which means getting dressed… I hope you’re enjoying your winter reads as much as I have been. Let me know if you find anything super good!